How can single-purpose service logic be positioned as an effective enterprise resource? Non-agnostic logic that is not service-oriented can inhibit the effectiveness of service compositions that utilize agnostic services. Non-agnostic solution logic suitable for service encapsulation can be located within services that reside as official members of a service inventory. 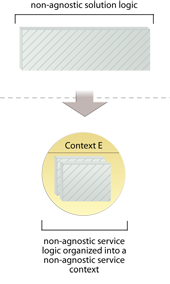 A single-purpose functional service context is defined. Although they are not expected to provide reuse potential, nonagnostic services are still subject to the rigor of serviceorientation. The non-agnostic service logic is encapsulated within a service based on a correspondingly non-agnostic service context (E). 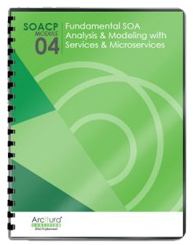 This pattern is covered in SOACP Module 4: Fundamental SOA Analysis & Modeling with Services & Microservices.